A report scrutinizing the Myanmar National Human Rights Commission (MNHRC) was released by civil society groups on 9th October in Yangon. The report shows the failings of the commission to address rights violations committed by the military and to comply with international standards. The report titled ‘Return to Sender: MNHRC Enabling Law, Must be Returned to Parliament for Structural Reform’ produced by organisations including the Human Rights Foundation of Monland (HURFOM) demonstrates many shortcomings of the MNHRC. “The MNHRC cannot handle the core problem of a human rights violations crisis in Myanmar. We really need a human rights commission which is independent from the Government and the military,” said Thwin Linn Aung, director of Genuine Peoples’ Servants. “The main weakness of the commission is that the members are not freely elected and there is no overall transparency. The parliament should make changes to the commission to be independent and follow the Paris Principles,” said Alex Moodie, the Research Director of Progressive Voice. 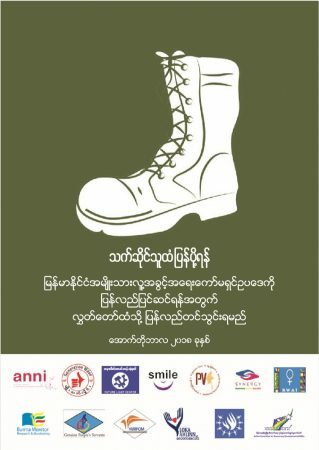 The 12 organizations are calling for urgent reform of the commission to increase the protection and promotion of human rights and provide mechanisms to handle properly complaints against the Burmese military and stop violations. Other key speakers at the event included Thinzar Shunlei Yi, the Advocacy Coordinator of Action Committee for Democracy Development, and Aung Khaing Min, the Executive Director of Progressive Voice. The report is available in both English and Burmese.